Grouchy, of an old noble family of Normandy, is an officer with the Bodyguards, when occurs the Revolution. It adopts the new ideas, côtoie brilliant spirits, such Beaumarchais, of Alembert, Turgot, Condorcet and Cabanis these two last will become his/her brothers-in-law besides and remains in the rows of the army. In 1792, it is named brigadier and command the cavalry of the Army of the Alps. It is sent in the Vendée. It must leave the army in 1793, following the decree excluding the noble ones from the Army. It re-enlists like private in the national guards. It is confirmed on June 11, 1795 like major general, rank which had conferred to him the police chiefs on the armies the previous year. He is a head of state major in the Army of the West. He becomes the second of Notch in the Vendée. 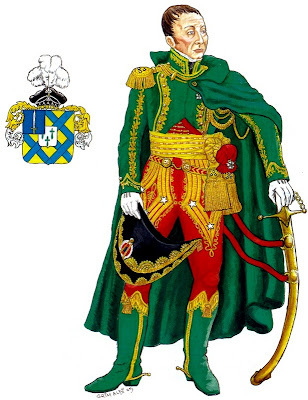 In 1796, the Directory names it second in command of the Army in charge of an unloading in Ireland. But it does not manage to take foot there. In 1798, it passes to the Army of Italy under the commands of Joubert. It is distinguished at the time of the battle of Novi (August 15, 1799) where, reached of fourteen wounds, it is finally made prisoner.On its return in France, it passed in the Reserve army. Moreau asks that Grouchy be affected for him. With head of a division of the Army of Moreau, it plays a decisive role with Hohenlinden (December 3, 1800). General controlling a division of cavalry, it takes part in the campaign of Prussia of 1806: it is the first to enter Lübeck. In Eylau on February 8, 1807, its load of cavalry is heroic. Four months later with Friedland (June 14, 1807), it is still distinguished. It is sent in Spain, is appointed governor of Madrid and takes part in the repression of May 2, 1808. Responsible for the command of the cavalry of the Army of Italy, it takes part in the battle of Raab (June 14, 1809) under the command of prince Eugene de Beauharnais. In Wagram in 1809, its division of dragons plays a decisive role. In Borodino in 1812, its command of IIIème body of cavalry is irreproachable. It is charged to cover the retirement of the Grande Armée. When at the end of the campaign, it asks to pass in the infantry, Napoleon refuses, wishing to preserve riding brilliant Si. But Grouchy, wounded in its love-clean, is withdrawn. There remains nevertheless faithful and proposes its services for the campaign of France, in 1814. It is named with the head of forces of cavalry and is distinguished in Vauchamps. Napoléon appoints it marshal, but it will obtain its patent only at the time of the Hundred Days. Present with Ligny (June 16, 1815), Grouchy controls the French cavalry. June 17, Napoleon gives him the command to continue Blücher with the head of two bodies of infantry and two bodies of cavalry to prevent the junction with Wellington. The Prussian masks the movement of his troops by leaving a rear-guard in curtain. June 18, Grouchy, on the road of Wavres, hears the noise of the guns of the battle of Mount-Saint-Jean. It is not diverted. It did not receive any command in this direction.With the second Restoration, Grouchy takes refuge in America. It re-enters to France in 1821, when Louis XVIII restores it in his titles, except for the title of marshal. Under the Monarchy of July, Louis-Philippe returns this title to him and names it Pair France. It dies in 1847.